The ancient town of Parentium – currently known as Poreč – was founded by the Romans on an already sparsely inhabited peninsula. The small town featured a square grid layout of Cardo and Decumanus streets shaping the blocks of public and residential buildings. The Forum was situated on the tip of the peninsula, where on the north side in the 3rd century an early Christian complex was built which later, in the 4th century, was given the shape of a veritable public church. It was in the mid-6th century that Euphrasius, Bishop of Parentium, thoroughly refurbished the complex, furnishing the large basilica with rich wall mosaics. 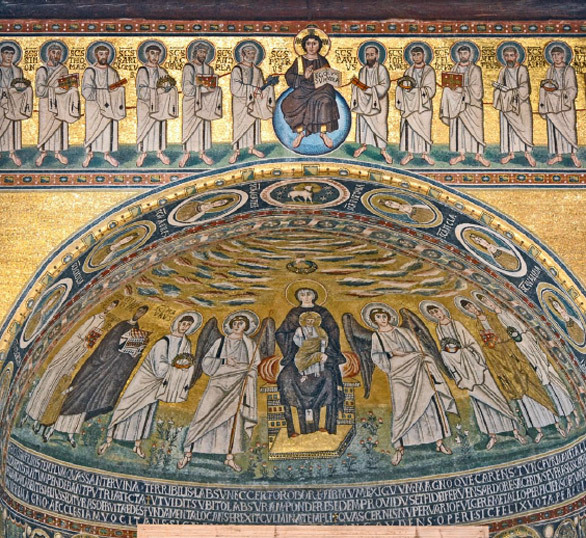 The Euphrasian episcopal complex has been inscribed on the UNESCO World Heritage List since 1997, after a lengthy argumentative process explaining the reasons as to why the Euphrasiana should occupy a unique place among the world monuments from the same period. While describing the Poreč cathedral posed no particular problems in itself, finding an unequivocal argument as to its purported uniqueness was required. The monument’s value lies not just in its aesthetic value for all to see, but also in the documentary and historical value of the complex on the whole and in each particular detail. Contemporary valorisation of this monument takes into account the fact that all of its structures, including the outwardly invisible ones (i.e. the interior masonry, the foundations, the mortar layers, the archaeological remains, the traces of building phases etc.) are endowed with great documentary and scientific value. One could also add to this the monument’s use, since it has stayed faithful to its original purpose. underwent a major overhaul and enlargement, this building phase becoming known as the Pre-Euphrasiana. It consisted of two parallel triple-nave basilicas separated by smaller rooms and a cistern. In front of both basilica’s façades a long narthex stretched, sporting a herringbone-patterned mosaic floor. The large (southern) basilica’s ground plan matches the current one, except for the eastern part where it ends in a straight wall. The Pre-Euphrasiana’s floor mosaics have reached us in a well-preserved state, its mosaic carpets still partially visible through the openings in the floor of the current basilica. The presbytery featured a synthronon – a semicircular bench for the clergy and the bishop. The smaller Pre-Euphrasian basilica’s vestiges have been retained as archaeological remains of parts of the triumphal arch and the beginning of the nearby arcade. During the early Middle Ages the church was reduced to the central nave, with a large stone sarcophagus installed in the apse under the arcosolium and a walled altar next to it. In the second phase of the early medieval renovation, the apse was altered with the insertion of three smaller hollowed apses. During the 14th century the space was turned into a sacristy, its walls featuring visible remains of Gothic-style frescoes. The Pre-Euphrasiana includes a preserved eight-sided baptistery with an inserted six-sided baptismal font. The atrium was located between the baptistery and the large basilica, and the former was surrounded by a polygonal ambulatory. of saints and angels as well as of archdeacon Claudius and his young son Euphrasius. A large inscription spanning the whole width of the apse stretches out in four lines of white letters on blue background spelling out that the church was built “from the foundations up” by Bishop Euphrasius in place of the “old temple“ which was dilapidated and shorn of décors. The lower register is taken up by scenes of the Annunciation and the Visitation, and images of St. Zachary and St. John the Baptist. 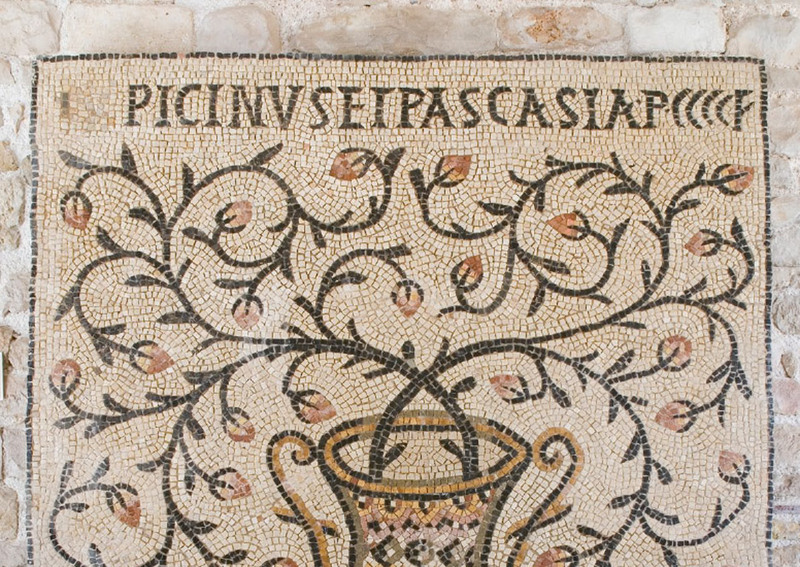 The mosaic is set off from the rest of the décor by a notable stucco garland in the apse’s ground level, consisting of a series of rectangular fields executed in the opus sectile marble and glass tiles in a dozen different hues, a special touch of light provided by the areas filled with mother-of-pearl. Near the apse’s bottom one finds a wholly preserved original synthronon i.e. marble bench for the clergy, complete with the bishop’s throne. The side apses contain partially preserved fragments of the calotte mosaic, depicting Christ placing the martyrs’ crowns on the saints’ heads. The atrium of the Euphrasiana is shaped as a quadriportico with a triple arch and a pair of pillars on each side. 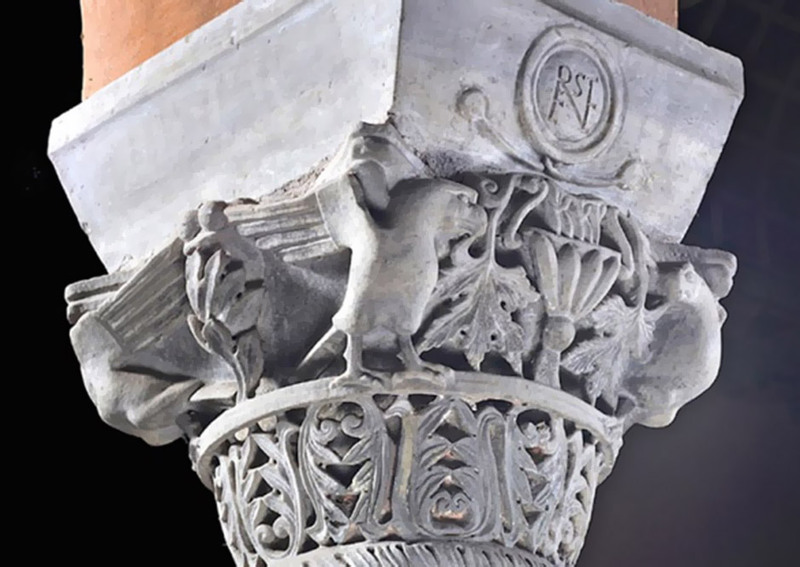 The pillars and capitals share the same execution as those in the basilica, except for the two pillars on the northern side, which are 19th-century copies. From the atrium the main basilica façade is visible, its upper side once decorated with mosaic scenes; this rare example of a mosaic image on the outside of a church building has unfortunately reached us in a very bad state. Traces of the original are to be found in a handful of tesserae and the empty slots where these once used to be, whereas the better preserved lower part of the façade mosaic had by the end of the 19th century undergone much invasive restoration. North of the basilica’s apses a smaller structure is found, also dating from Bishop Euphrasius’ time. It is a cella trichora, consisting of a trefoil-shaped vaulted space with an elliptical vestibule at the front. It was possibly used as a mausoleum. Herein fragments of a polychrome 6th-century mosaic have been found; in its centre there is a large marble sarcophagus – a reliquiary from 1247 hosting the relics of the Parentine twin patron saints, Maurus and Eleutherius. The palace is located north of the atrium. It is a one-story building with a large central hall on the first floor. On the northern side the spaces are furnished with semi-circular apses, the middle one larger that the others. The large hall is very well preserved in its entire height. This used to be Bishop Euphrasius’ ceremonial hall whence he presided over the diocese and town, and represents a prime example of a hierarchically organised and oriented space. The rectangular hall is lit through a row of windows just under the ceiling (one of them including a well-preserved original stone transenna), whereas the large apse receives sunlight from five ample lower windows. The central triple arcade fronting the large apse – a tribelon – is also very well preserved. 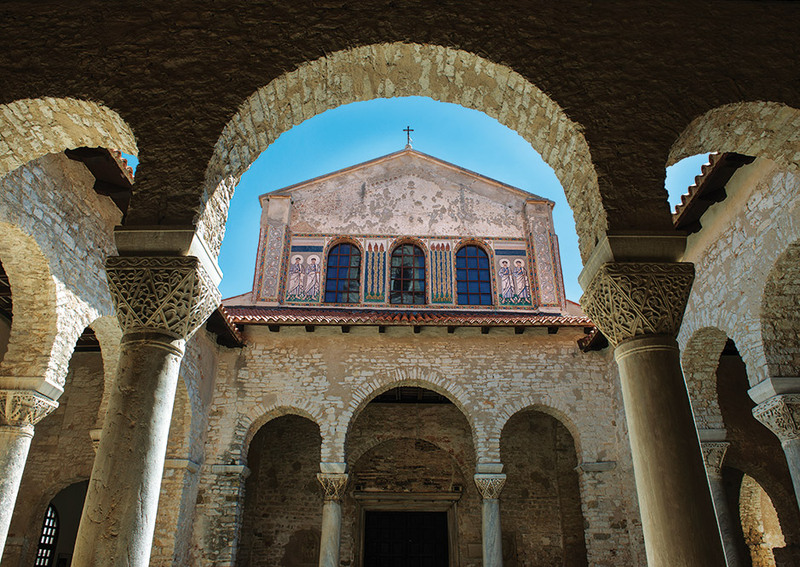 The edifice is equally the result of Bishop Euphrasius’ building activity during the middle of the 6th century, representing as it does the only preserved example of this building type from the early Christian period. The smaller, eastern room bears the signs of changes in the course of the centuries: spaces were modified, openings closed and reopened, the wall coating replastered, yet the masonry of the original load-bearing walls managed to remain largely untouched. The western salon hosts a baroque stuccowork and fresco paintings from the era of Bishop Polesini (end of the 18th century). The restored diocesan building now contains the church museum displaying stone monuments and finds from years long archaeological excavations, such as numerous fragments of original floor mosaics from the 4th and 5th centuries, fragments of sculptures ranging from the 2nd to the 6th centuries, a fragment of a floor mosaic with the depiction of a fish (a symbol of Christ) originating from the paving of the 4th century, Bishop Euphrasius’ altar front realised in Proconnesian marble with symbolic reliefs and an inscription, and a monolithic episcopal cathedra from the 8th century which comes from the northern church. On the first floor, in the rooms of the one-time bishop’s residence from the 18th century, there are displayed artworks from the cathedral as well as from dilapidated churches throughout the Poreč and Pula Diocese, Romanic crucifixes, a Gothic and Renaissance wooden statuary, a polyptych by Antonio Vivarini (1440), a triptych by Anthony of Padua (1529), and several liturgical vestments and silverware. The episcopal complex of the Euphrasian Basilica underwent very few changes since the 6th century. During the Middle Ages the smaller basilica was abandoned and demolished. The presbytery’s appearance was somewhat modified in 1267 with the building of a square ciborium with mosaic decoration. In the mid-19th century the basilica was inappropriately enlarged by adding two side chapels which were later removed in the course of restoration works in the period between the two World Wars. Its current shape possibly represents the best preserved early Christian cathedral complex worldwide.